Happy Monday to you! Here’s an easy tangle pattern named Cornman from California tangler Kim Cyr and it’s her first on the site. Cornman‘s quirkiness appealed to me and in perfect time for an Autumn theme, Kim tells us how her tangle came about its name. 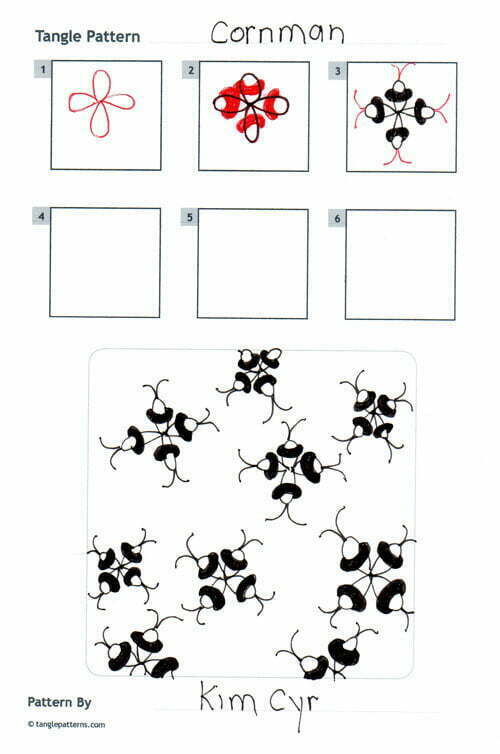 Cornman is a fun tangle and it can easily can fill up a section of your Zentangle® with a sense of movement. It looks cool with double or even triple antennae too. I live in San Diego, California … and when I first saw Zentangle I was hooked. I knew that I had to find a way to be able to draw like this, and I did. I’ve always colored; as a child, I’d spend entire days in my room coloring and as an adult I still colored. I wasn’t artistic enough to draw (or so I thought) but I could color up a storm. Zentangle was everything I wanted. I could learn to make my own designs and color too, if I wanted. I have a daughter with autism. I spend a lot of time with her. Sometimes I just need to get away and can’t do it, but I can get away with Zentangle. I can lose myself for hours but still be present enough for my daughter. I even get excited at the thought of being home for an extended period of time; I can tangle! Kim illustrates the step-by-step instructions for drawing Cornman below. Image copyright the artist and used with permission, ALL RIGHTS RESERVED. You may use this image for your personal non-commercial reference only. Republishing or redistributing pattern deconstructions in any form is prohibited under law without express permission of the copyright owner. Check out the tag kimc for more of Kim’s tangles on TanglePatterns.com. How beautiful, fun and quirky and how beautifully simple. I love what Linda said about them; I see little groups of four little Martian guys, fun little guys in their own flying saucers. I like it. It looks like fun to do. I will put it in my pattern book and use it very soon. So fun! I like it. Cornman was a fun tangle! I’m having such a good time with this tangle. It’s fun, it’s easy and you can use it in everything that I tangle. Thanks for a great tangle, it’s fun and easy, will be using this tonight. Hi! I like the Cornman tangle. Its cute and fun. It kind of looks like alien bug. Hope you don’t mind me saying that. I drew it in my pattern book. Thank you for sharing and have a great day.